The T. Boone Pickens Hospice and Palliative Care Center, owned and operated by Presbyterian Communities and Services (PCS), will be the first campus of its kind. PCS will offer a comprehensive approach to end-of-life care with five “Centers of Excellence,” including the Inpatient Care Center, Child and Bereavement Center, Resource and Education Center, Spiritual Care Center, and Outdoor Reflection Center. The 9-acre property will be developed as a phased campus and serve as the headquarters for Faith Presbyterian Hospice’s community-care, outreach, home hospice, and training facilities. MESA worked with the design team to create a comprehensive site assessment that led to a holistic outdoor program, final master plan, and Phase I development for the Outdoor Reflection Center (ORC). Private, semi-private, and public areas were created for specialized care to fulfill a variety of patient and family needs. 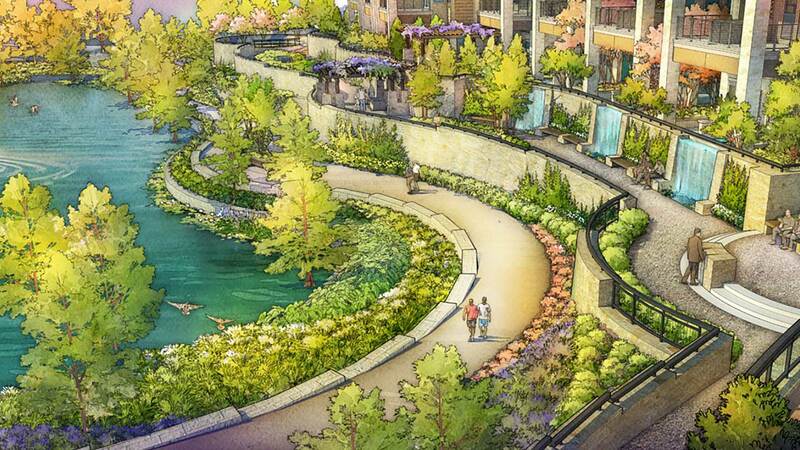 The design of the ORC includes the reformation of an existing lake, the creation of the Lakeside Terrace Gardens, partnerships with both Audubon International and Audubon Texas, and programmed amenities such as an amphitheater, labyrinth, courtyards, salubrious gardens, and trails throughout the site that offer a thoughtful balance of social interaction and privacy.